Physical examination and laboratory testing lack sufficient accuracy to distinguish cholecystitis from cholelithiasis. As a result, imaging studies are often required to safely disposition patients presenting with right upper quadrant or epigastric pain. Ultrasound is the initial test of choice in the majority of these cases, and generally relies a combination of findings (anterior gallbladder wall thickening, pericholecystic fluid/wall edema, hydrops, or a sonographic Murphy’s sign) to establish a definitive diagnosis. We suggest that the Stone-In-Neck (SIN) phenomenon, defined as an immobile stone lodged in the neck of the gallbladder, is specific for cholecystitis in the absence of other findings. We prospectively compared the surgical pathologies of 57 patients diagnosed with either SIN or simple lithiasis to determine the incidence of cholecystitis in each group. SIN had a specificity of 97% and a positive predictive value of 93% in diagnosing cholecystitis. Physicians performing right upper quadrant ultrasound should have a high index of suspicion for cholecystitis when the SIN phenomenon is present, and should be aware that this group of patients are at much higher risk for cholecystitis than those with simple lithiasis. Gallstones are estimated to occur in over 20% of Americans annually. Although the majority of these patients are asymptomatic, biliary colic develops in 1–4% of these individuals each year, and acute cholecystitis develops in approximately 20% of these patients . The standard evaluation consists of a history and physical examination, laboratory analysis, and diagnostic imaging. Isolated clinical and laboratory findings are neither sensitive nor specific, with the classic triad of right upper quadrant pain, fever, and leukocytosis occurring in a minority of these cases . The current gold standard for diagnosis is now considered to be a positive hepatobiliary imino-diacetic acid scan (HIDA). Ultrasonographic evidence is also used to confirm this diagnosis, and has a sensitivity of approximately 87% and a specificity of approximately 82% . Because of its ready availability and high diagnostic accuracy, ultrasound is generally considered the initial test of choice for the evaluation of gall bladder disease, with HIDA reserved for those patients with an equivocal result. The classic ultrasonographic findings of cholecystitis include a sonographic Murphy’s sign , a thickened gallbladder wall [5, 6], gallbladder wall edema, gallbladder hydrops, and pericholecystic fluid. Previous research has stated that these findings have their highest predictive value when combined and that none stand alone in being able to accurately diagnose cholecystitis. In the course of our clinical experience, we have noted a stone in the neck (SIN), defined as an immobile stone lodged in the neck of the gallbladder without anechoic space between the neck and stone it contains (Fig. 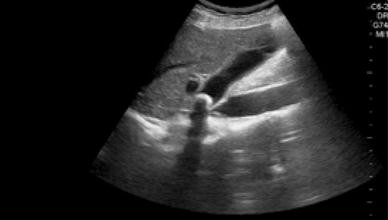 1) to be highly suggestive of cholecystitis even in the absence of any other ultrasonographic signs of infection. We propose that emergency physicians (EPs) can utilize ultrasound to diagnose cholecystitis based solely on the “Stone-In-Neck” (SIN) phenomenon. We have defined SIN as an immobile gallstone wedged in the gallbladder neck with a lack of anechoic space between the gallbladder neck and the immobile stone it contains (Fig. 1). Immobility is verified by scanning the patient in the supine position and then rolling them to the left lateral decubitus position visualizing the gallbladder in its entirety in both instances. The left lateral decubitus position is taken to the extreme with the patient near prone. This study was approved by our hospital’s Institutional Review Board prior to data collection. A suburban academic university-affiliated emergency department (ED) with 75,000 visits per year. This prospective study includes a convenience sample of patients presenting with RUQ abdominal pain who received focused emergency ultrasound examinations in the ED. The ultrasound exams were performed and interpreted by emergency ultrasound fellowship-trained physicians, all EM board-certified or board eligible. The ultrasound machine used was a General Electric Logic 5, with a curvilinear 3–5 MHz probe. We obtained a minimum of three images. One sagittal, one transverse and one of the common bile duct as close as possible to the neck of the gallbladder. We compared the surgical pathologies of patients with a positive SIN phenomenon versus those with simple lithiasis. Each patient with a positive SIN phenomenon had HIDA scan or surgical pathology results recorded. Only surgical pathology was used as the gold standard, as HIDA scans are not routinely performed. Each patient discharged from the emergency department with no surgical intervention received a follow-up phone call 14 days after his/her ED visit. Patients with RUQ abdominal pain receiving focused biliary emergency ultrasound examinations demonstrating either the SIN phenomenon or simple cholelithiasis, without any other findings of cholecystitis, were included. Patients with any classic ultrasonographic criteria for cholecystitis (sonographic Murphy’s sign, thickened gallbladder wall, gallbladder wall edema, gallbladder hydrops, pericholecystic fluid), or any other cause of anterior gallbladder wall thickening (i.e. ascites) were excluded. We enrolled 57 patients. Of these, 14 had ultrasounds interpreted as positive for the SIN phenomenon. Surgical pathology was positive for cholecystitis in all but one of these patients. The lone outlier was a pregnant female managed conservatively initially with antibiotics, but eventually requiring cholecystectomy. Of the 43 with simple lithiasis, 10 had surgical pathology consistent with cholecystitis. The sensitivity of the SIN phenomenon was 56.52% (34.39–76.81). The specificity was 97.06% (84.67–99.93). The positive and negative predictive values were 92.86% (66.13–99.82) and 76.74% (61.37–88.24), respectively. In general, point-of-care ultrasound is thought to have a sensitivity of 87% and a specificity of 82% for cholecystitis . However, no single ultrasound finding is sufficient to reliably predict this pathology, and diagnosis requires an integration of findings with the overall clinical scenario. For example, gallstones combined with either a sonographic Murphy’s sign or gallbladder wall thickening have positive predictive values of over 90% for cholecystitis . Our findings suggest a similarly high specificity and positive predictive value for the SIN phenomenon, which we believe should be used to accurately diagnose cholecystitis even in the absence of any other sonographic findings. We believe that using the SIN phenomenon as a sole predictor of cholecystitis will allow for a more rapid diagnosis and an earlier intervention on these patients. According to the CDC’s National Center for Health Care Statistics approximately 20 cholecystectomies are performed annually per 10,000 people in the United States. Billions are spent annually in both diagnosing and treating this disease . The SIN phenomenon allows the physician to accurately and rapidly predict cholecystitis, and can decrease the morbidity in these potentially ill patients. Unnecessary repeat physician or ED visits will also be decreased, as many of these patients are frequently treated symptomatically for simple biliary colic. All of the focused sonograms in this study were performed by highly experienced, fellowship-trained emergency physicians. Our findings may, therefore, not be generalizable to all emergency physicians. Additionally, we used a convenience rather than a consecutive sample, and collected data at only one institution. Lastly, because the clinician performing the exam was often the same physician enrolling patients in the study, the investigators may have been biased to negate subtle positive findings (Murphy’s sign, pericholecystic fluid, wall edema, or wall thickening) to strengthen the results. Our findings indicate a high specificity and positive predictive value for the SIN phenomenon in diagnosing cholecystitis. Emergency physicians should have a low threshold for surgical consultation when this finding is present, and should be cautious not to dismiss a SIN as a simple gallstone.